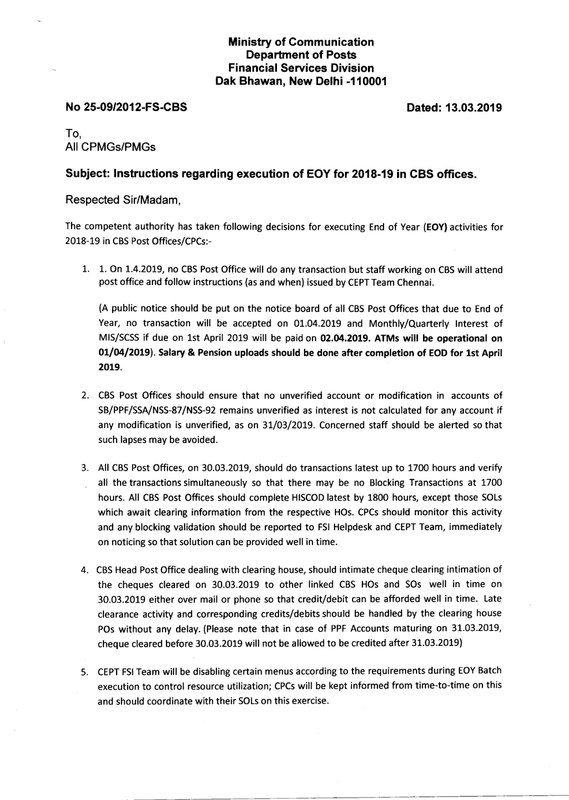 As per CBS manual rule 28 withdrawal mode is not as Postmaster's cheque , hence withdrawl from Saving Account cant be taken through Postmaster's Cheque. The rule is placed below. (3) Withdrawal through ATM debit card. Uncheck the “Today transaction only” box. Now you have the values which can be summed according to credit and debit. 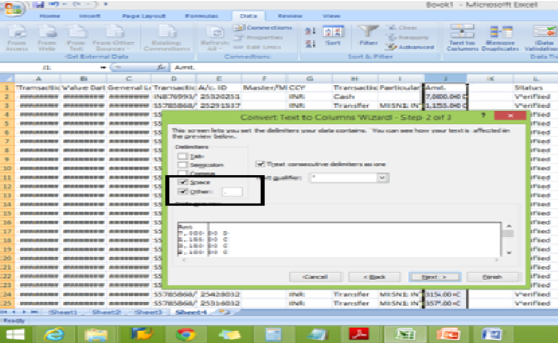 Then go to K th column then select 00 C for credit transaction and 00 D for debit transaction. You are all aware that we are nearing the End of the Financial Year where interest calculation and posting are due for SB/PPF/NSS/SSA accounts. Request you to please advise Post Offices to verify all the accounts which have been modified but verification is pending since interest posting for such accounts will fail resulting in complaints and tickets being raised for non-posting of interest. 2. Enter the Table Short Name as "GAM"
3. 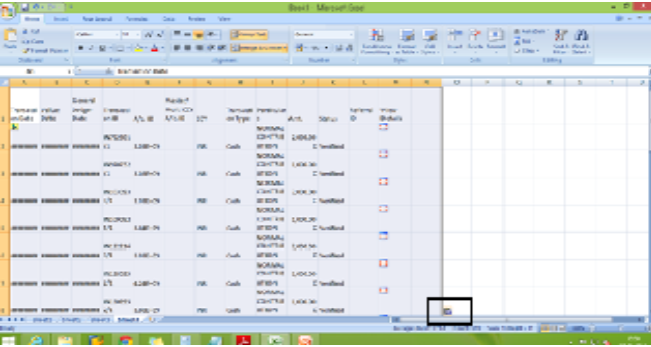 In the Ref NO files "give two blank spaces"
5. Enter the function code as "M"
6. Select the Authorized option as "Not authorized"
After entering all the details then click on Go then the system will show the list of unverified accounts. If any verification is pending in DOP Finalce application then the system will not calculate the interest for such unverified accounts. So kindly verify immediately. Accounts thus identified have to verified to ensure interest is calculated and posted in them . 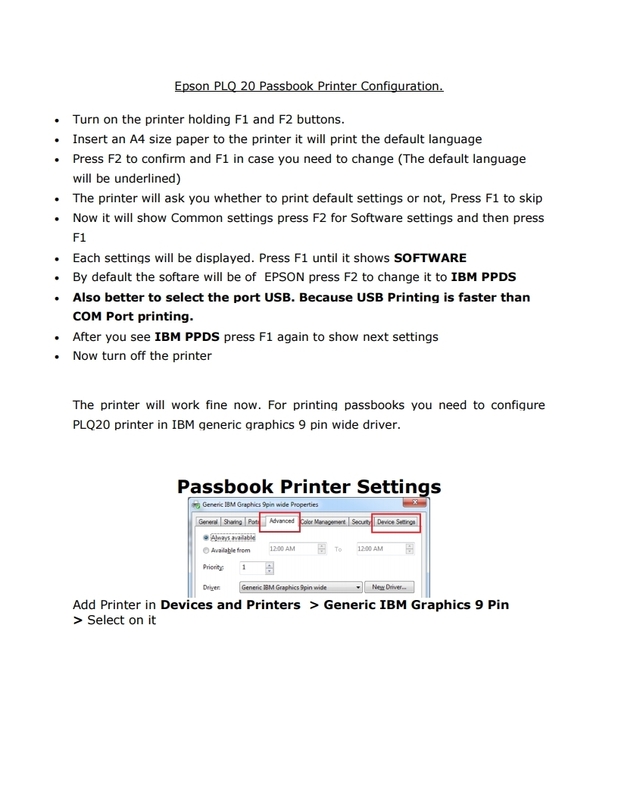 Turn on the printer holding F1 and F2 buttons. Also better to select the port USB. Because USB Printing is faster than COM Port printing. 1.Scenario:- When a certificate holders attend CBS Post Office from where Certificates were purchased for transfer of certificates to another CBS Post Office. 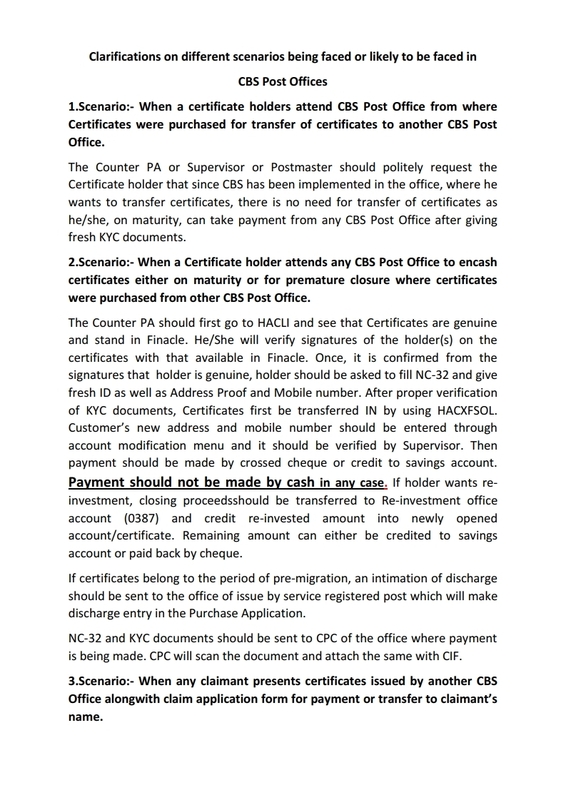 The Counter PA or Supervisor or Postmaster should politely request the Certificate holder that since CBS has been implemented in the office, where he wants to transfer certificates, there is no need for transfer of certificates as he/she, on maturity, can take payment from any CBS Post Office after giving fresh KYC documents. 2.Scenario:- When a Certificate holder attends any CBS Post Office to encash certificates either on maturity or for premature closure where certificates were purchased from other CBS Post Office. The Counter PA should first go to HACLI and see that Certificates are genuine and stand in Finacle. He/She will verify signatures of the holder(s) on the certificates with that available in Finacle. Once, it is confirmed from the signatures that holder is genuine, holder should be asked to fill NC-32 and give fresh ID as well as Address Proof and Mobile number. After proper verification of KYC documents, Certificates first be transferred IN by using HACXFSOL. Customer’s new address and mobile number should be entered through account modification menu and it should be verified by Supervisor. Then payment should be made by crossed cheque or credit to savings account. Payment should not be made by cash in any case. If holder wants re-investment, closing proceeds should be transferred to Re-investment office account (0387) and credit re-invested amount into newly opened account/certificate. Remaining amount can either be credited to savings account or paid back by cheque. If certificates belong to the period of pre-migration, an intimation of discharge should be sent to the office of issue by service registered post which will make discharge entry in the Purchase Application. NC-32 and KYC documents should be sent to CPC of the office where payment is being made. CPC will scan the document and attach the same with CIF. 3.Scenario:- When any claimant presents certificates issued by another CBS Office alongwith claim application form for payment or transfer to claimant’s name. 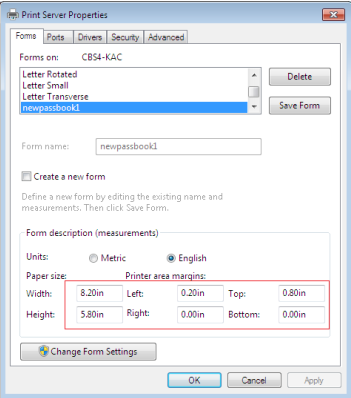 In CBS environment, claim form can be submitted at any CBS post office. When such a claim is presented at any CBS post office, first of all, user has to enter date of death in the CIF and supervisor has to verify. Then procedure of settlement of deceased claim case has to be followed. After sanction of claim, if claimant wants payment, procedure mentioned in scenario 2 should be followed. If claimant wants to transfer of certificates in his/her name, open new CIF in his/her name based on new AOF(if no CIF is available in his/her name) and attach the existing Certificates (Accounts) with new CIF. Name of holder can be changed through menu HAALM. In this case also, If certificates belong to the period of pre-migration, an intimation of discharge or sanction of claim should be sent to the office of issue by service registered post which will make discharge entry in the Purchase Application and attach sanction memo. Claim Application Form and KYC documents of claimant and Account Opening Form (AOF) should be sent to CPC of the office where payment is being made or claim is sanctioned. 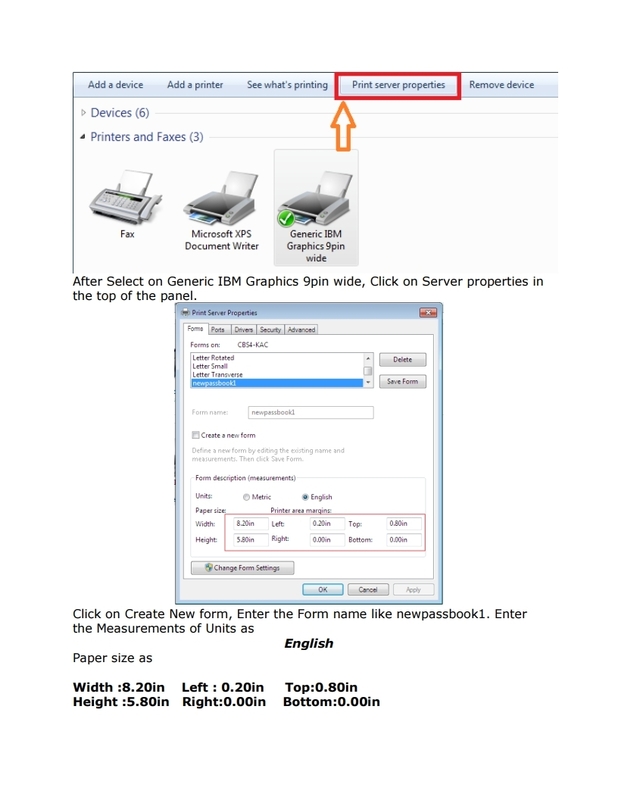 CPC will scan the document and attach the same with CIF. 4. 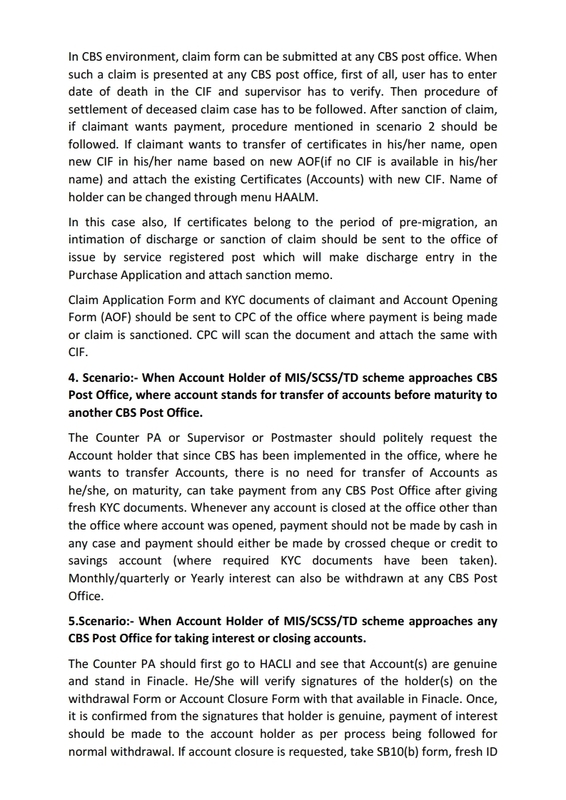 Scenario:- When Account Holder of MIS/SCSS/TD scheme approaches CBS Post Office, where account stands for transfer of accounts before maturity to another CBS Post Office. fresh KYC documents. Whenever any account is closed at the office other than the office where account was opened, payment should not be made by cash in any case and payment should either be made by crossed cheque or credit to savings account (where required KYC documents have been taken). Monthly/quarterly or Yearly interest can also be withdrawn at any CBS Post Office. should either be made by crossed cheque or credit to savings account (where required KYC documents have been taken) only.If holder wants re-investment, closing proceedsshould be transferred to Re-investment office account (0387) and credit re-invested amount into newly opened account/certificate. Remaining amount can either be credited to savings account or paid back by cheque. SB10(b) and KYC documents should be sent to CPC of the office where payment is being made. 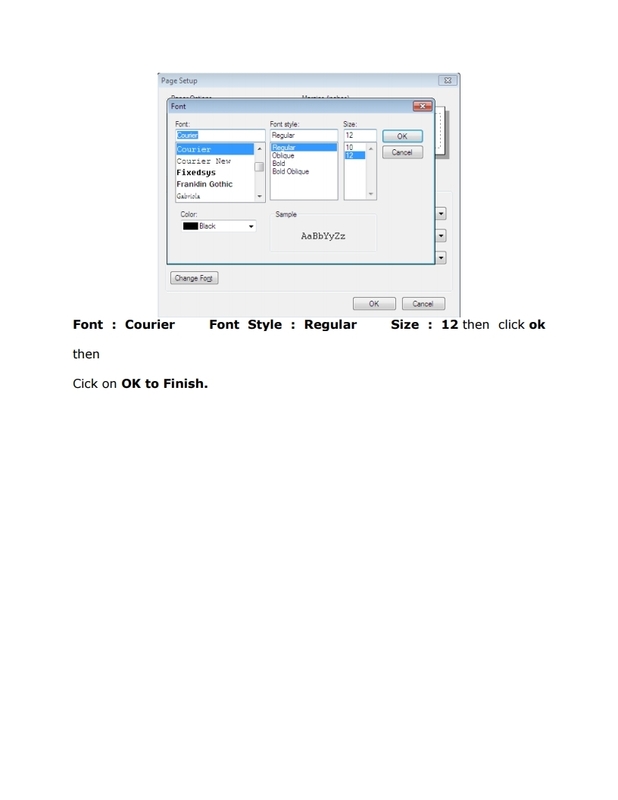 CPC will scan the document and attach the same with CIF. 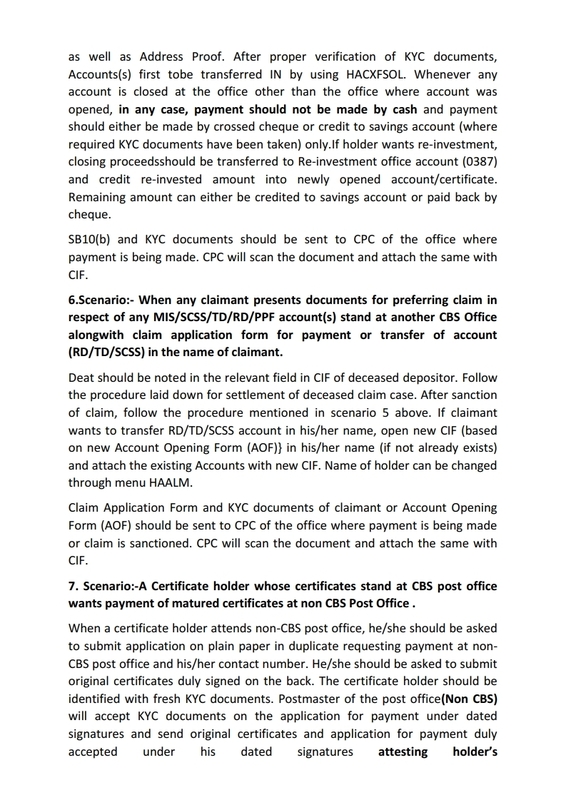 6.Scenario:- When any claimant presents documents for preferring claim in respect of any MIS/SCSS/TD/RD/PPF account(s) stand at another CBS Office alongwith claim application form for payment or transfer of account(RD/TD/SCSS) in the name of claimant. Deat should be noted in the relevant field in CIF of deceased depositor. Follow the procedure laid down for settlement of deceased claim case. After sanction of claim, follow the procedure mentioned in scenario 5 above. If claimant wants to transfer RD/TD/SCSS account in his/her name, open new CIF (based on new Account Opening Form (AOF)} in his/her name (if not already exists) and attach the existing Accounts with new CIF. Name of holder can be changed through menu HAALM. Claim Application Form and KYC documents of claimant or Account Opening Form (AOF) should be sent to CPC of the office where payment is being made or claim is sanctioned. CPC will scan the document and attach the same with CIF. 7. Scenario:-A Certificate holder whose certificates stand at CBS post office wants payment of matured certificates at non CBS Post Office . When a certificate holder attends non-CBS post office, he/she should be asked to submit application on plain paper in duplicate requesting payment at nonCBS post office and his/her contact number. He/she should be asked to submit original certificates duly signed on the back. The certificate holder should be identified with fresh KYC documents. 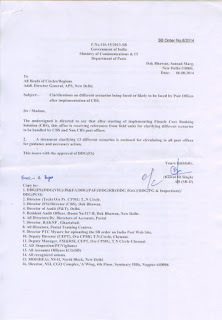 Postmaster of the post office(Non CBS) will accept KYC documents on the application for payment under dated signatures and send original certificates and application for payment duly accepted under his dated signatures attesting holder’s signature with designation stamp by service Insured Post to the Postmaster ofCBS Post Office from where certificates were purchased. He will enter details of certificates and holder (including contact number) in a register to be maintained in manuscript. 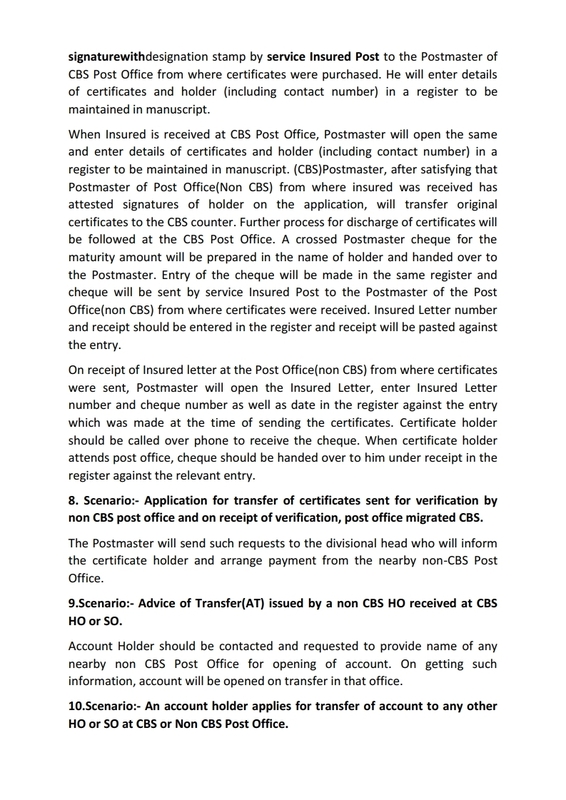 When Insured is received at CBS Post Office, Postmaster will open the same and enter details of certificates and holder (including contact number) in a register to be maintained in manuscript. (CBS)Postmaster, after satisfying that Postmaster of Post Office(Non CBS) from where insured was received has attested signatures of holder on the application, will transfer original certificates to the CBS counter. Further process for discharge of certificates will be followed at the CBS Post Office. A crossed Postmaster cheque for the maturity amount will be prepared in the name of holder and handed over to the Postmaster. Entry of the cheque will be made in the same register and cheque will be sent by service Insured Post to the Postmaster of the Post Office(non CBS) from where certificates were received. Insured Letter number and receipt should be entered in the register and receipt will be pasted against the entry. On receipt of Insured letter at the Post Office(non CBS) from where certificates were sent, Postmaster will open the Insured Letter, enter Insured Letter number and cheque number as well as date in the register against the entry which was made at the time of sending the certificates. Certificate holder should be called over phone to receive the cheque. When certificate holder attends post office, cheque should be handed over to him under receipt in the register against the relevant entry. 8. Scenario:- Application for transfer of certificates sent for verification by non CBS post office and on receipt of verification, post office migrated CBS. The Postmaster will send such requests to the divisional head who will inform the certificate holder and arrange payment from the nearby non-CBS Post Office. 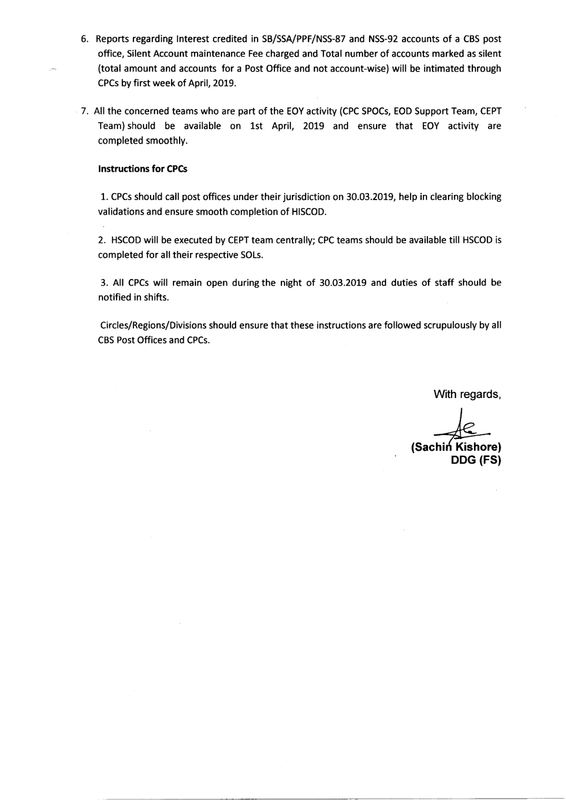 9.Scenario:- Advice of Transfer(AT) issued by a non CBS HO received at CBS HO or SO. Account Holder should be contacted and requested to provide name of any nearby non CBS Post Office for opening of account. On getting such information, account will be opened on transfer in that office. 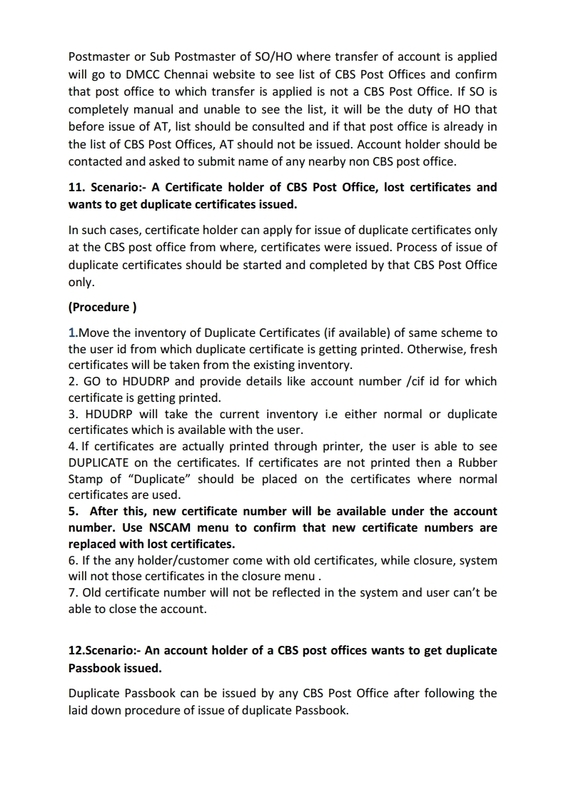 10.Scenario:- An account holder applies for transfer of account to any other HO or SO at CBS or Non CBS Post Office.Postmaster or Sub Postmaster of SO/HO where transfer of account is applied will go to DMCC Chennai website to see list of CBS Post Offices and confirm that post office to which transfer is applied is not a CBS Post Office. 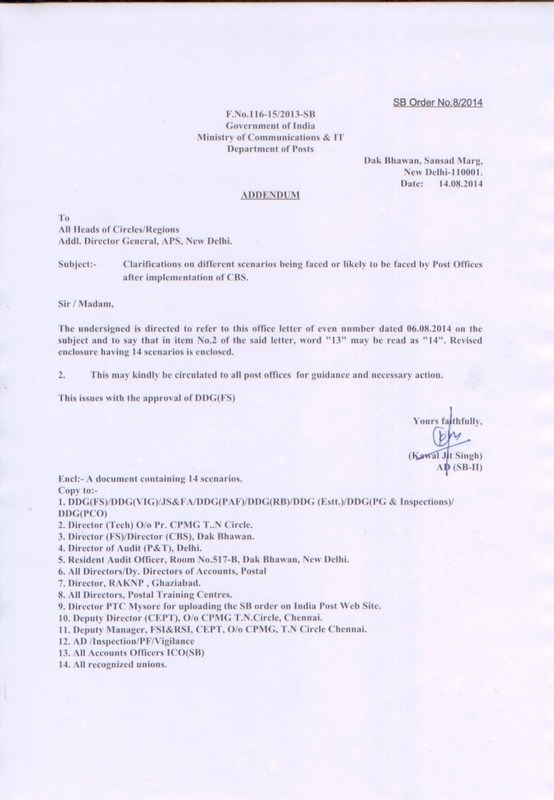 If SO is completely manual and unable to see the list, it will be the duty of HO that before issue of AT, list should be consulted and if that post office is already in the list of CBS Post Offices, AT should not be issued. Account holder should be contacted and asked to submit name of any nearby non CBS post office. 11. Scenario:- A Certificate holder of CBS Post Office, lost certificates and wants to get duplicate certificates issued. In such cases, certificate holder can apply for issue of duplicate certificates only at the CBS post office from where, certificates were issued. Process of issue of duplicate certificates should be started and completed by that CBS Post Office only. 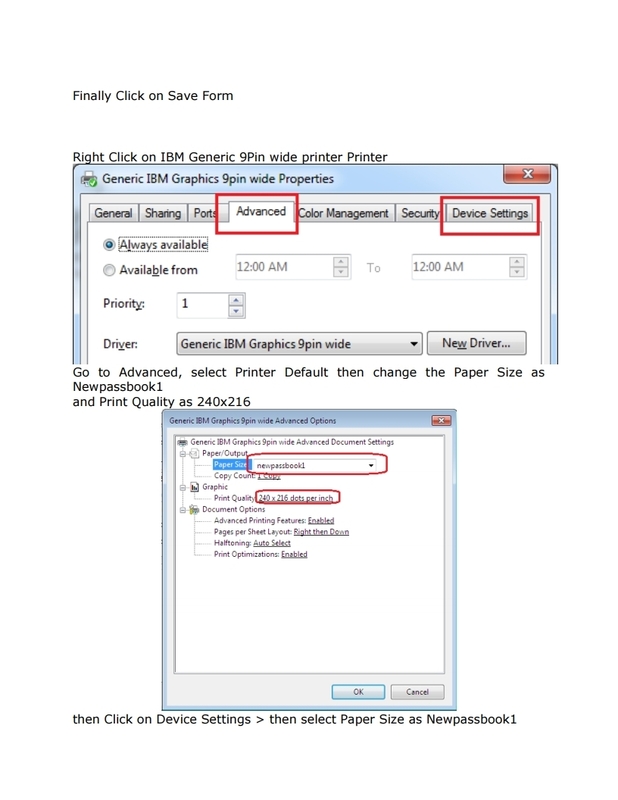 1.Move the inventory of Duplicate Certificates (if available) of same scheme to the user id from which duplicate certificate is getting printed. Otherwise, fresh certificates will be taken from the existing inventory. 2. GO to HDUDRP and provide details like account number /cif id for which certificate is getting printed. 3. HDUDRP will take the current inventory i.e either normal or duplicate certificates which is available with the user. 4. 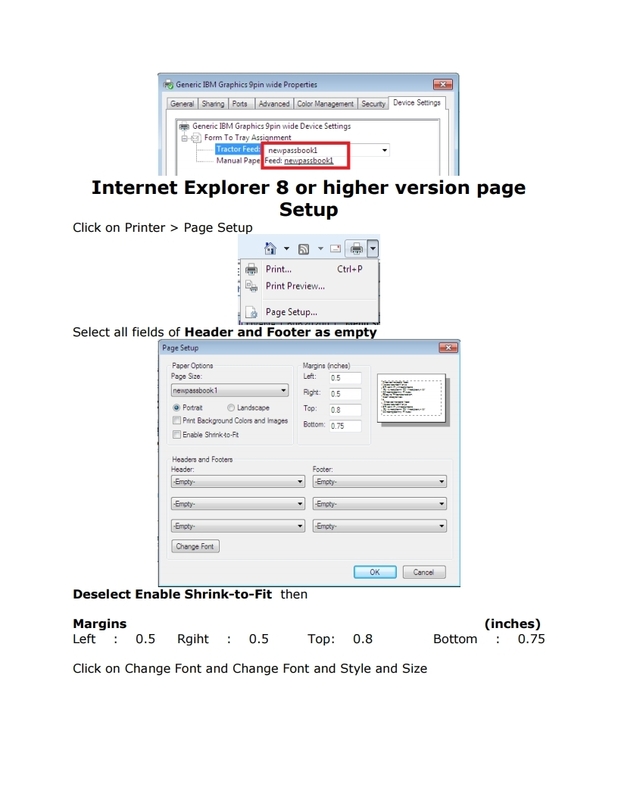 If certificates are actually printed through printer, the user is able to see DUPLICATE on the certificates. If certificates are not printed then a Rubber Stamp of “Duplicate” should be placed on the certificates where normal certificates are used. 5. After this, new certificate number will be available under the account number. Use NSCAM menu to confirm that new certificate numbers are replaced with lost certificates. 6. If the any holder/customer come with old certificates, while closure, system will not those certificates in the closure menu . 7. Old certificate number will not be reflected in the system and user can’t be able to close the account. 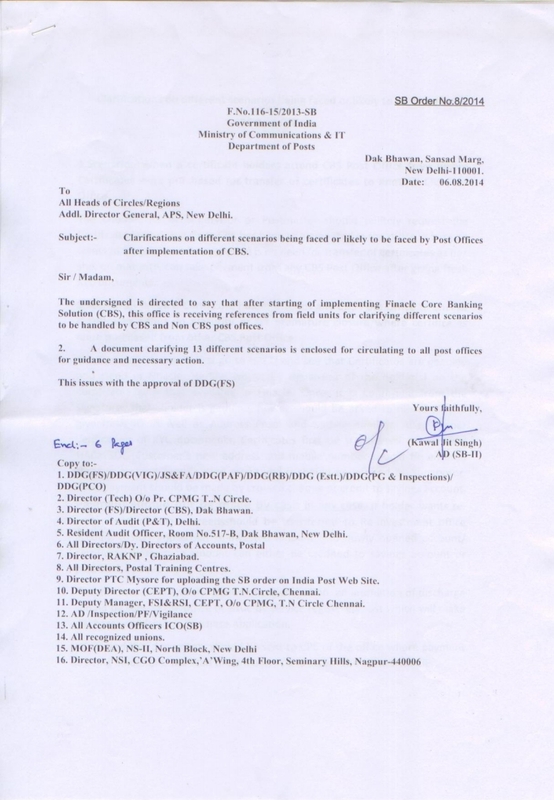 12.Scenario:- An account holder of a CBS post offices wants to get duplicate Passbook issued. In CBS environment, transactions can be initiated in any CBS Post Office. Any depositor of Savings, RD, TD, MIS, SCSS, PPF or Certificates can initiate transaction either Financial or Non-Financial at any CBS Post Office. Transaction will appear in the Report No.19 i.eCommon Counter Wise Transactions Report-Inter Branch of the office where transaction is initiated. Amount of the transaction would also appear in Consolidation of the same office. No transaction would appear in the office where account/certificate stands. Extra care should be taken at the time of such transactions. In respect of withdrawal from savings Account for more than for Rs. 50,000/- , it should be allowed only if required KYC documents of the account holder (s) have been taken. In respect of accepting deposits, no extra care is required to be taken. any CBS Post Office but it should be supported by documentary proof. This document and application for modification (to be taken on A4 size paper) should be sent to concerned CPC where modification is being done for scanning and attaching to CIF. Please ensure that all Financial or Non Financial Transactions should be verified by Supervisor/SPM at the same office and same time when initiated. 14. 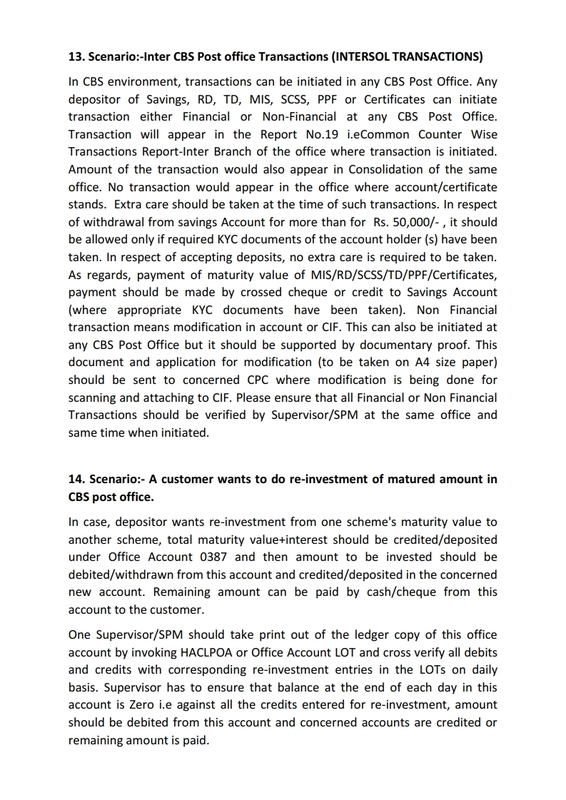 Scenario:- A customer wants to do re-investment of matured amount in CBS post office. In case, depositor wants re-investment from one scheme's maturity value to another scheme, total maturity value+interest should be credited/deposited under Office Account 0387 and then amount to be invested should be debited/withdrawn from this account and credited/deposited in the concerned new account. Remaining amount can be paid by cash/cheque from this account to the customer. 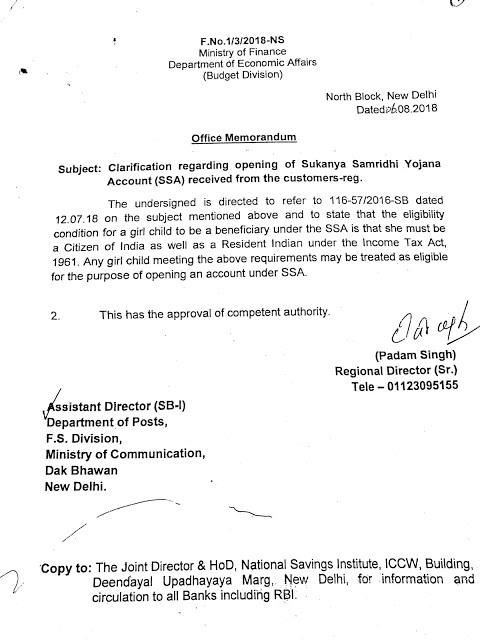 Clarification on opening of Sukanya Samriddhi Account in Post Offices has received from Ministry of Finance against the query raised by the customer. The eligibility condition for Girl child to be a beneficiary under SSA is that she must be a Citizen of India as well as Resident Indian under the Income Tax Act, 1961. Any girl child meet the above requirements may be treated as eligible for the purpose of opening of an account under SSA Scheme.